When can the Friendship Series High Back Booster be used as a backless booster seat? Children in the UK must travel with an appropriate car seat/booster seat until they reach 135cm tall (4ft 5"). In Ireland and France it is 150cm (4ft 9"). Always use an appropriate car seat approved for your child's weight and height. All our current seats are tested and meet the safety requirements of regulation ECE R44 04 which states that backless booster seats are suitable for children over 15kg (2 stone 5 pounds), around 3-4 years old. The new R-129 regulation applies only to new models of backless booster seats designed and tested after December 2016 and states that they shall only be suitable for children over 125cm (4ft 1") or 22kg, (whichever comes first) around 7 years old. This regulation does not affect any of our current seats and it is still perfectly legal and safe to buy and use a backless booster seat that has been tested to ECE R44 04 safety requirements and use it within the weight range specified. The BPA (Baby Products Association) and car seat makers who help develop the laws have confirmed there are no plans to completely ban backless booster seats. For the reasons set out above, we always recommend you use a high back car seat for as long as possible. However, backless booster seats offer valuable safety protection by positioning the lap strap away from the child's abdomen which helps to protect against internal injuries in the event of a collision. It is always safer to use a backless booster seat rather than no car seat at all. Can I use the KidsEmbrace car seat on aircraft? The KidsEmbrace Friendship Series Combination Harness to Booster Car seat can be used on aircraft when using the 5-point harness system. The Booster Seat can NOT be used on any aircraft. Use this car seat only on forward-facing aircraft seats, along with the 5-point harness and in a position where the lap belt can be tightened securely where the buckle does not lie directly over any part of the frame or under the structure of the KidsEmbrace car seat after tightening. Contact the airline prior to your flight so as to ensure that your car seat complies with the airline's specific regulations. Take your instruction manual with you to the airport as verifictaion of ECE R44-04 certification and to assist in the correct installation of the car seat . What are the weight and height requirements for your Friendship Series High Back Booster Seats? Our Friendship Series high back booster Seat is designed for use by children who weigh between 9.97kg and 45.35kg, and measure between 73.6cm and 144.7cm in length. Child MUST be at least one year of age to use this car seat, as it is a forward facing only car seat. Child can stay in the harness until 29.48kg, but may begin using the car seat as a belt-positioning booster at 13.6kg. At 29.48kg or 124.4cm, your child should discontinue use of the harness system, and the car seat going forward should only be used as a belt-positioning booster. Child should discontinue use of our Friendship Series high back booster Seat once he reaches either 45.35kg, or 144.7cm, whichever happens first. I am having difficulty installing my car seat, what should I do? Where can I purchase the KidsEmbrace car seats? KidsEmbrace car seats can be purchased online or in-store. We advise that you always call your chosen store in advance and inquire about availability. I was involved in a car accident. Should I replace my KidsEmbrace car seat? In the event of a moderate to severe automobile incident in which a child’s car seat, whether occupied or unoccupied at the time of the incident, is involved, it is the recommendation of KidsEmbrace that the car seat be replaced immediately, as an automobile accident can cause unseen damage to a car seat. What is the expiry date of my car seat? Kids Embrace Friendship Series Group 1,2,3 – recommended length of use, 6 years. Kids Embrace Fun Ride Series Group 2,3 - recommended length of use, 7 years. You can calculate the expiry date by adding the recommended length of use to the date of manufacture of your seat. 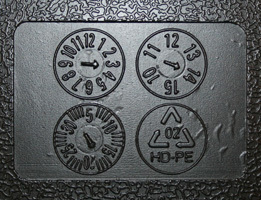 The date of manufacture can be located on the rear or base of the seat, moulded into the plastic. Recommending an expiry date is a practice from America that has been adopted throughout Europe, although not part of the testing regulations. Over time, the materials used to manufacture the car seat could begin to degrade, so an old car seat may not perform exactly as it did when first manufactured and tested. Car seats which are more than 6 or 7 years old are not necessarily dangerous to use, providing they meet current regulations, are in good condition, with the harness intact and they are fitted and used correctly (and suitable for the child). However, there are usually advances in materials and child car seat safety, so a newer seat should provide the very best protection. Should I use a second hand car seat? Be sure that the car seat has NEVER been involved in a crash. Make sure that all the parts are present and the seat is in good working order. Ensure that you check the parts and function against the original product manual and that there are no cracks in the plastic or fraying on the seat harness. Ensure that there has never been a recall on that batch of car seats. You can do this by checking the manufacturers website. How to dispose of a damaged or expired car seat? Try your hardest to recycle your car seat. Some retailers offer trade-in promotions from time to time so you can exchange your seat for a discount against a new one. If this is not the case and you are taking your seat to a recycling centre, be sure to remove the seat cover and detach the buckles and harness. This is essential to ensure the easy recovery of recyclable materials, but more importantly, will ensure that nobody tries to use an unsafe car seat.